Completed in 1932, Going To The Sun Road is a modern, architectural marvel. As Glacier National Park’s main road, it cuts directly through the park’s heart, meandering through valleys and cedar forests, along turquoise, glacial rivers, and under holes blasted through the Montana mountains. As it ascends to 6,646 feet, Going To The Sun Road hugs sheer cliffs, teeters on precipices, and twists, turns and jibes up the mountain, before finally crossing the Continental Divide at Logan Pass. It’s 52 miles of motorist heaven, offering many pullouts and affording visitors numerous opportunities to soak up the scenic views and click away with their cameras. 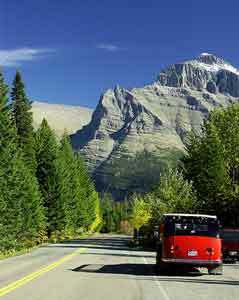 Glacier National Park provides a shuttle service for visitors, which allows tourists to park at a location such as Many Glacier Lodge or Lake McDonald, take a shuttle, do their day hike, and shuttle back. What’s so particularly wonderful about this is that it allows you to marvel at the views on rather than worry about keeping your car on the road. Although few wildflowers dot the roadway, be sure to stop at Logan Pass to gaze at wildflower meadows dotted in yellow, purple and orange. Be sure to read the wildflower identification guide so you can discern between Indian Paintbrush and Beargrass. 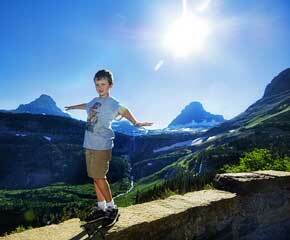 The Road’s pinnacle is Logan Pass, which is on the Continental Divide at 6,646 feet. There’s a plethora of hikes that begin at this location, as well as a Visitors Center. Wildlife viewing opportunities are plentiful on Going To The Sun Road, particularly near the Highline Trail and Logan Pass. Keep your eyes peeled for bighorn sheep and mountain goats in this area. Many grizzly bears and black bears with their cubs cross the road’s eastern end, near the Siyeh Pass trailhead. If you plan on hiking in Glacier National Park, which I highly recommend, please be certain of the necessary safety precautions for hiking in Grizzly Bear habitat. An informative way to spend the afternoon and enjoy soaking up the views on Going To The Sun Road is by riding a Red Jammer Bus up the road. The tour guides are very knowledgeable and excellent wildlife spotters. If you’re tired or soar from a long hike, this is a wonderful way to enjoy your day. For the photographers out there, be sure to photograph Goose Island in St. Mary Lake. There’s a pullout at the west end of St. Mary Lake, which is where the majority of photographers, professional and novice alike, shoot from when capturing this highly photogenic locale. 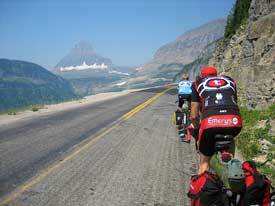 Shockingly, in addition to cars, you’ll notice many cyclists huffing and puffing while ascending the road. Be cautious and alert, particularly while descending! The road’s narrow enough as it is without having to worry about cyclists. Personally, I never attempted the ride up. But while working at Lake Mcdonald Lodge, it was a ritual to throw our bikes in the back of a pickup truck, drive to Logan Pass and cruise down in the light of a full moon. Frightening, to say the least. A quick note: due to snowfall and the difficulty in plowing the road, it doesn’t typically open until early June and closes in the middle of October, so plan your trip accordingly.